We are always amazed to see our collaborators doing such impressive and innovative work. One of the biggest challenges within 3D Bioprinting is getting the stem cells that make up the bioink to survive during the 3D printing process, let alone keep them viable long enough to become a full tissue structure. You may read of what feels like several success stories but truth be told, it really is amazing when an advance in bioprinting is actually made. As you may have seen about a month ago, our friends at Sahlgrenska Acamdemy and Chalmers University of Technology not only implanted 3D printed human cartilage cells into mice, but got them to survive and grow after implantation. This was absolutely a time to celebrate. Now our friends at Sahlgrenska Academy is back in the news for their advances in 3D bioprinting. A team of researchers at Sahlgrenska Academy has managed to generate cartilage tissue by printing stem cells using a 3D-bioprinter. The fact that the stem cells survived being printed in this manner is a success in itself. In addition, the research team was able to influence the cells to multiply and differentiate to form chondrocytes (cartilage cells) in the printed structure. The findings have been published in Nature’s Scientific Reportsmagazine. The research project is being conducted in collaboration with a team of researchers at the Chalmers University of Technology who are experts in the 3D printing of biological materials. Orthopedic researchers from Kungsbacka are also involved in the research collaboration. The team used cartilage cells harvested from patients who underwent knee surgery, and these cells were then manipulated in a laboratory, causing them to rejuvenate and revert into “pluripotent” stem cells, i.e. stem cells that have the potential to develop into many different types of cells. The stem cells were then expanded and encapsulated in a composition of nanofibrillated cellulose and printed into a structure using a 3D bioprinter. Following printing, the stem cells were treated with growth factors that caused them to differentiate correctly, so that they formed cartilage tissue. The publication in Scientific Reports is the result of three years of hard work. “In nature, the differentiation of stem cells into cartilage is a simple process, but it’s much more complicated to accomplish in a test tube. 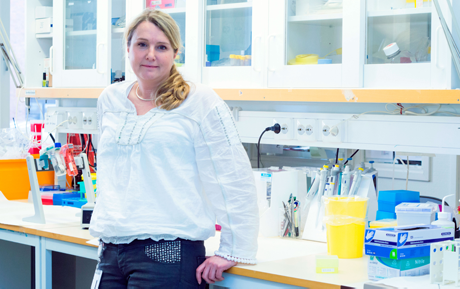 We’re the first to succeed with it, and we did so without any animal testing whatsoever,” says Stina Simonsson, Associate Professor of Cell Biology, who lead the research team’s efforts. Most of the team’s efforts had to do with finding a procedure so that the cells survive printing, multiply and a protocol that works that causes the cells to differentiate to form cartilage. “We investigated various methods and combined different growth factors. Each individual stem cell is encased in nanocellulose, which allows it to survive the process of being printed into a 3D structure. We also harvested mediums from other cells that contain the signals that stem cells use to communicate with each other so called conditioned medium. In layman’s terms, our theory is that we managed to trick the cells into thinking that they aren’t alone,” clarifies Stina Simonsson. Therefore the cells multiplied before we differentiated them. A key insight gained from the team’s study is that it is necessary to use large amounts of live stem cells to form tissue in this manner.